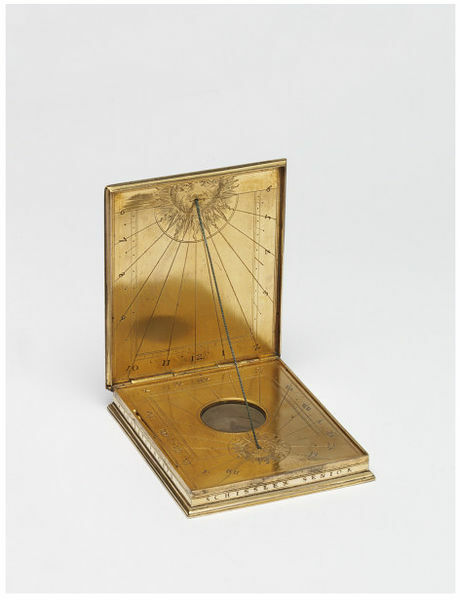 Portable sundials enabled travellers to predict the time while on the road. The 'diptych' dial, with two leaves hinged together, was one of the most common forms. This dial has the hours of the day engraved on both leaves and a compass inserted on the lower leaf. Diptych dials were produced in Nuremberg, southern Germany, from the early 16th century by specialist compass makers. This dial is signed by Christopher Schissler's of Augsburg and dated 1581. Schissler's workshop was famous. He supplied precision instruments of exquisite quality to an international clientele including the courts of August I, the Elector of Saxony and Emperor Rudolph II of Prague. Specialist makers of scientific instruments catered for an increased interest in navigation, travel, geography and the workings of the universe. By the 1580s, it was fashionable for wealthy gentlemen to have a sound understanding of all branches of learning, from arts and literature to mathematics and the natural sciences. This sundial was not simply a functional timepiece but also a treasury item, bought for its craftsmanship and ingenuity. Sundials were housed alongside automatons, clocks and astrolabes in Scientifica, collections celebrating human ability to control nature. They were designed to impress as well as educate. The dial is engraved with the arms of Fugger-Kirchberg-Weissenhor, a prominent group of European bankers from the southern German city of Augsburg. They traded throughout Europe and funded military and political campaigns. 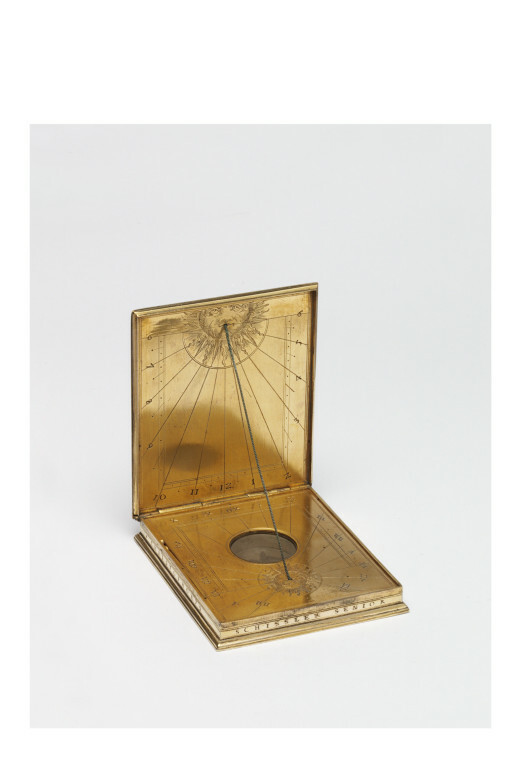 Pocket sundial and compass of sheet brass, gilt, etched and engraved. The dial is of diptych form and comprises two leaves hinged together, with the dials on the inside. The gnomon (the part of the instrument that casts the shadow onto the dial) is provided by a string stretched between the inner surfaces of the two leaves. The dials are engraved with the 'common hours', the lower one in Roman numerals and with a compass under glass in the centre. The top cover of the dial is engraved with the arms of the prominent Augsburg family Fugger-Kirchberg-Weissenhorn. The bottom cover is etched with strapwork and arabesques. On the outside walls of the dial is inscribed: *CHRISTOPHORVS SCHISSLER SENIOR FACIABAT AVGVSTA ANNO x 1581*. Inscribed on the outside walls of the dial. The dial is engraved with the arms of Fugger-Kirchberg-Weissenhorn. The Fugger family was a historically prominent group of European bankers from the southern German city of Augsburg. They traded throughout Europe and funded military and political campaigns. They were accepted in princely circles as they not only acted as patrons for artists and scholars, but advanced huge loans such as when the Emperor Charles V needed to pay the electors who appointed him. No details of the provenance of the object are known. It was bought by the Museum in 1921 for £20 from Mr C.F. Corbould Ellis of Stevenage, Herts. (RP 31/3491). Historical significance: Not only is this dial engraved with the arms of Fugger-Kirchberg-Weissenhorn, an important German family of bankers, it was also made by one of the most celebrated scientific instrument makers of the 16th century. Christopher Schissler's workshop was famous in his own time. He was born in around 1531 and started his workshop after 1550. He supplied precision instruments of exquisite quality including globes, astrolabes, sundials, armillary spheres, astronomical compendia and surveying and drawing equipment. Schissler's clientele was international. Many of his dials are laid out for English or Italian latitudes. In 1571 Schissler travelled to the Dresden court of August I, the Elector of Saxony, in order to set up and demonstrate his instruments. He also visited in 1583 the court of Emperor Rudolf II in Prague who was well-known for his fascination with clocks. From 1580 Schissler produced many surveying instruments and became invloved with the survey of the town of Augsburg between 1598 and 1602. Around a hundred instruments from Schissler's workshop survive. His eldest son Christopher Schissler Junior (also known as Hans Christoph) also became an instrument maker. Christoph Schissler Senior died on 14 September 1608. The 'diptych' dial, with two leaves hinged together, was one of the most common forms of portable sundial. Diptych dials were produced in Augsburg and Nuremberg, southern Germany, from the early 16th century by specialist compass makers. This plain dial has the hours of the day engraved on both dials but more elaborate ones were designed to be used in more than one latitude, with a series of holes in the upper leaf, through which the string could be threaded to adjust its angle to the correct latitude. 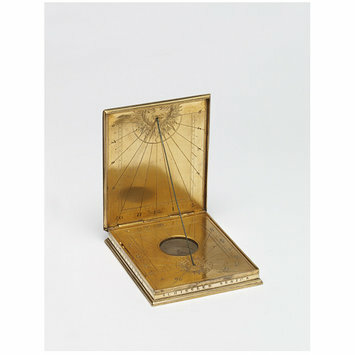 Pocket sundial and compass of sheet brass, gilt, etched and engraved. The instrument is in the form of a book, the cover engraved with the arms of the prominent Augsburg family Fugger-Kirchberg-Weissenhorn. Signed along the outside walls: *CHRISTOPHORVS SCHISSLER SENIOR FACIABAT AVGVSTA ANNO x 1581*. Christopher Schissler (around 1531-1608) added 'Senior' to his signature in 1581 after his son Christopher (also known as Hans Christoph) began making instruments.